SACKETT, BYRON.Age, 20 years. Enlisted, October 7, 1862, at Stanford; mustered in as corporal, Co. G, August 7, 1863, to serve three years; reduced, December 16, 1863; appointed commissary sergeant, April 20, 1864; reduced and appointed sergeant, June 25, 1864; captured, March 26, 1865, near Snow Hill, N.C.; discharged, August 1, 1865, at New York. SACKETTS, CHARLES.Age, 18 years. Enlisted, December 3, 1862, at Hudson; mustered in as private, Co. C, February 17, 1863, to serve three years; appointed trumpeter, December 3, 1862; reduced, date not stated; transferred to Co. A, January 1, 1865; returned from missing in action, June 20, 1865; mustered out with company, July 19, 1865, at Raleigh, N.C.; also borne as Sackett. SALISBURY, JOHN H.Age, 18 years. Enlisted, September 5, 1864, at Albany; mustered in as private, Co. D, September 5, 1864, to serve one year; discharged, June 23, 1865, at Tarboro, N.C., General Order No. 83, Adjutant Generals Office. SALTER, FRANK.Age, 19 years. Enlisted, December 28, 1863, at New York city; mustered in as private, Co. C, December 28, 1863, to serve three years; appointed corporal, June 1, 1864; sergeant, January 9, 1865; mustered out with company, July 19, 1865, at Raleigh, N.C.
SAMBIER, JOHN, see Landier, John. SAMMONS, JAMES.Age, 34 years. Enlisted, November 1, 1862, at Hudson; mustered in as private, Co. E, March 31, 1863, to serve three years; no further record. SANBORN, WALLACE M.Age, 28 years. Enlisted, August 20, 1862, at Granby, mustered in as sergeant, Co. B, November 19, 1862, to serve three years; mustered in as second lieutenant, Co. G, February 7, 1865; mustered out with company, July 19, 1865, at Raleigh, N.C. Commissioned second lieutenant, January 20, 1865, with rank from December 11, 1864, vice Burr, promoted; first lieutenant, April 22, 1865, with rank from January 19, 1865, vice Putman, not mustered; not mustered. SANDER, CAESAR.Age, 19 years. Enlisted, April 9, 1863, at New York; mustered in as private, Co. D, April 9, 1863, to serve three years; transferred to Co. C, and appointed corporal, May 20, 1863; captured, August 24, 1863, at Washington, N.C.; reduced to ranks, June 1, 1864; borne as missing upon muster out of company, July 19, 1865; no further record. SANDERS, MELANCTHON.Age, 27 years. Enlisted, September 25, 1862, at Austerlitz; mustered in as private, Co. C, February 25, 1863, to serve three years; appointed, corporal, September 21, 1863; discharged, June 23, 1865, at Greensboro, N.C.; also borne as Saunders. SANDS, BENJAMIN.Age, 19 years. Enlisted, February 11, 1863, at Buffalo; mustered in as private, Co. F, February 11, 1863, to serve three years; transferred to Co. E, May 20, 1863; mustered out, August 15, 1865, at Rochester, N.Y.
SANFORD, FREDERICK.Age, 27 years. Enlisted, December 28, 1863, at Brooklyn; mustered in as private, Co. C, December 28, 1863, to serve three years; discharged, June 16, 1865, at New Berne, N.C., General Order No. 37. SANGLING, JOHN.Age, 21 years. Enlisted, April 22, 1863, at New York; mustered in as private, Co. F, April 28, 1863, to serve three years; missing in action, April 20, 1864, at Plymouth, N.C.; died June 23, 1864, at Andersonville, Ga.
SARGENT, JAMES.Age, 33 years. Enlisted, November 17, 1862, at New York; mustered in as private, "unassigned," November 17, 1862, to serve three years; no further record. SARGENT, JOHN E.Age, 25 years. Enlisted, November 28, 1862, at Buffalo; mustered in as private, Co. H, November 28, 1862, to serve three years; transferred to Co. D, May 20, 1863; appointed corporal, June 30, 1863; mustered out, July 19, 1865, at Raleigh, N.C.
SAUNDERS, JOHN.Age, 24 years. Enlisted, October 6, 1864, at Buffalo; mustered in as private, Co. K, October 6, 1864, to serve three years; mustered out with company, July 19, 1865, at Raleigh, N.C.
SAUNDERS, JOHN.Age, 23 years. Enlisted, August 13, 1862, at Fulton; mustered in as private, Co. A, November 19, 1862, to serve three years; missing in action, April 20, 1864, at Plymouth, N.C.; died, while a prisoner, at Andersonville, Ga.
SAUNDERS, MELANCTHON, see Sanders. Melanethon. SAVAGE, HIRAM.Age, 33 years. Enlisted, December 15, 1862, at Syracuse; mustered in as private, Co. A, March 31, 1863, to serve three years; transferred to Co. B, May 20, 1863; died of disease, July 2, 1863, at Camp Harris, near New Berne, N.C.
SAVAGE, HORACE.Age, 38 years. Enlisted, December 15, 1862, at Syracuse; mustered in as private, Co. A, March 31, 1863, to serve three years; transferred to Co. B, May 20, 1863; sick in General Hospital in New York city, on muster out of company, July 19, 1865; also borne as Savage, Forest. SAVAGE, JAMES W.Age, 37 years. Enrolled, November 25, 1863, at Albany; mustered in as colonel, December 14, 1863, to serve three years; mustered out with company, July 19, 1865, at Raleigh, N.C. Commissioned Colonel, January 14, 1864, with rank from November 20, 1863, original. SAVAGE, JOSEPH.Age, 18 years. Enlisted, September 27, 1864, at Troy; mustered in as private, "unassigned," September 29, 1864, to serve three years; discharged, May 8, 1865, at Harts Island, New York Harbor. SAVAGE, OCTAVUS.Age, 27 years. Enlisted, August 30, 1862, at Oswego; mustered in as private, Co. B, November 19, 1862, to serve three years; mustered out with company, July 19, 1865, at Raleigh, N.C.
SAXBY, ROBERT.Age, 35 years. Enlisted, August 31, 1864, at Troy; mustered in as private, "unassigned," August 31, 1864, to serve one year; discharged, June 23, 1865, at Tarboro, N.C., per General Order No. 83. SAYERS, JOHN W.Age, 25 years. Enlisted, June 30, 1863, at New York; mustered in as private, Co. G, August 7, 1863, to serve three years; deserted, August 27, 1863, at Staten Island, N.Y.
SCHAFER, CHAS. H., see Shafer, Chas. H.
SCHANG, NICHOLAS.Age, 30 years. Enlisted, August 15, 1863, at Buffalo; mustered in as farrier, Co. K, September 10, 1863, to serve three years; mustered out with company, July 19, 1865, at Raleigh, N.C.
SCHEPPACS, BRUNO.Age, 23 years. Enlisted, November 25, 1862, at New York; mustered in as private, "unassigned," November 25, 1862, to serve three years; no further record. SCHLAGER, LEWIS.Age, 18 years. Enlisted, August 20, 1863, at Buffalo; mustered in as private, Co. K, September 10, 1863, to serve three years; sick in hospital at Newark, N.J., on muster out of company, July 19, 1865; no further record. SCHLEHR, PETER.Age, 18 years. Enlisted, October 5, 1863, at Buffalo; mustered in as private, Co. M, November 24, 1863, to serve three years; died of disease, March 9, 1864, in General Hospital, New Berne, N.C.
SCHLOEGEL, FRANCIS.Age, 32 years. Enlisted, July 21, 1863, at Buffalo; mustered in as bugler, Co. H, August 27, 1863, to serve three years; reduced to ranks, September 3, 1863; detached as musician, with regimental band, November 22, 1863; mustered out with company, July 19, 1865, at Raleigh, N.C.; prior service in Twenty-first New York Volunteers. SCHMIDHAUSER, ALOIS.Age, 32 years. Enlisted, December 24, 1862, at New York; mustered in as private, "unassigned," December 24, 1862, to serve three years; no further record. SCHMIDT, CHARLES.Age, 21 years. Enlisted, January 26, 1864, at New York; mustered in as private, Co. K, January 26, 1864, to serve three years; no further record. SCHMIDT, HENRY.Age, 32 years, Enlisted, December 4, 1862, at New York; mustered in as private, "unassigned," December 4, 1862, to serve three years; no further record. SCHMIDT, JOHN.Age, 34 years. Enlisted, June 29, 1863, at Buffalo; mustered in as sergeant, Co. H, August 27, 1863, to serve three years; appointed commissary sergeant, December 1, 1863; mustered out with company, July 19, 1865, at Raleigh, N.C.; prior service in Twenty-first New York Volunteers. SCHMIDT, JOHN.Age, 31 years. Enlisted, November 29, 1862, at New York; mustered in as private, "unassigned," November 29, 1862, to serve three years; no further record. SCHMIDT, JOHN E.Age, 45 years. Enlisted, August 19, 1863, at Buffalo; mustered in as private, Co. K, September 10, 1863, to serve three years; sick in hospital, at New Berne, N.C. at muster out of company, July 19, 1865; no further record. SCHMIDT, JOSEPH.Age, 27 years. Enlisted, December 30, 1862, at Buffalo; mustered in as private, Co. F, December 20, 1862, to serve three years; deserted as of Co. E, May 18, 1863, from Staten Island; also borne as Smith. SCHMIDT, JULIUS.Age, 21 years. Enlisted, December 2, 1862, at New York; mustered in as private, "unassigned," December 2, 1862, to serve three years; no further record. SCHMIDT, MICHAEL.Age, 45 years. Enlisted, January 22, 1863, at Buffalo; mustered in as private, Co. E, January 22, 1863, to serve three years; no further record. SCHNEIDER, PAUL.Age, 20 years. Enlisted, December 16, 1862, at New York; mustered in as private, "unassigned," December 16, 1862, to serve three years; no further record. SCHNEITER, JOSEPH.Age, 27 years. Enlisted, December 18, 1862, at New York; mustered in as private, "unassigned," December 19, 1862, to serve three years; no further record. SCHODDROFF, MICHAEL.Age, 25 years. Enlisted, November 29, 1862, at New York; mustered in as private, "unassigned," November 29, 1862, to serve three years; no further record. SCHOOH, JACOB. - Age, 44 years. Enlisted, December 13, 1862, at New York; mustered in as private, "unassigned," December 13, 1862, to serve three years; no further record. SCHOVEL, STEPHEN.Age, 28 years. Enlisted, May 14, 1863, at New York; mustered in as private, Co. G, August 7, 1863, to serve three years; mustered out with company, July 19, 1865, at Raleigh, N.C.; also borne as Scoval. SCHREMER, WILLIAM.Age, 18 years. Enlisted, January 4, 1864, at New York; mustered in as private, "unassigned," January 4, 1864, to serve three years; no further record. SCHRYVER, ELY C.Age, 42 years. Enlisted, August 14, 1862, at Fulton; mustered in as private, Co. A, November 19, 1862, to serve three years; no further record. SCHULER, PETER, see Schuyler, Peter. SCHULLY, WILLIAM.Age, 35 years. Enlisted, February 28, 1863, at Troy; mustered in as private, Co. A, March 31, 1863, to serve three years; transferred to Co. B, May 20, 1863; deserted, May 25, 1863, from Camp Washington, Staten Island, N.Y., as Scully. SCHULTZ, ERNEST.Age, 26 years. Enlisted, December 11, 1862, at New York; mustered in as private, "unassigned," December 11, 1862, to serve three years; prior service in Third New York Volunteer Artillery; no further record. SCHULTZ, WILLIAM.Age, 23 years. Enlisted, January 2, 1864, at New York; mustered in as private, Co. D, January 2, 1864, to serve three years; discharged, August 15, 1864, from Newark Hospital, N.J.
SCHUYER, JACOB.Age, 30 years. Enlisted, August 11, 1863, at Buffalo; mustered in as private, Co. H, August 27, 1863, to serve three years; appointed corporal, May 3, 1864; sergeant, April 21, 1865; reduced to ranks, date not stated; mustered out with company, July 19, 1865, at Raleigh, N.C.
SCHUYLER, PETER.Age, 36 years. Enlisted, February 8, 1864, at Buffalo; mustered in as private, Co. I, February 11, 1864, to serve three years; mustered out with company, July 19, 1865, at Raleigh, N.C.; also borne as Schuler; veteran. SCHWARZ, HERMAN.Age, 33 years. Enlisted, December 23, 1862, at New York; mustered in as private, "unassigned," December 23, 1862, to serve three years; no further record. SCHWAYER, FREDERICK.Age, 21 years. Enlisted, September 1, 1863, at Buffalo; mustered in as private, Co. K, September 10, 1863, to serve three years; captured during attack on New Berne, N.C., February 1, 1864; died, June 18, 1864, in rebel prison; also borne as Schweiger. SCOTLAND, HORACE, see Crocker, Horace. SCOTT, DAVIS.Age, 21 years. Enlisted, September 17, 1863; at Buffalo; mustered in as private, Co. L, September 25, 1863, to serve three years; discharged for disability, December 20, 1863, at New Berne, N.C.; also borne as Daniel Scott. SCOTT, ELISHA B.Age, 18 years. Enlisted, December 10, 1862, at Albany, as private, Co. E, to serve three years; enlisted in Twelfth Cavalry and went to Fifth Cavalry. SCOTT, EDWIN T.Age, 24 years. Enlisted, November 11, 1862, at Cuba; mustered in as commissary sergeant, Co. E, March 31, 1863, to serve three years; transferred to Co. C, May 20, 1863; reduced to ranks, June 30, 1863; appointed sergeant, January 1, 1864; quartermaster sergeant, June 1, 1864; mustered out with company, July 19, 1865, at Raleigh, N.C.; also borne as Edward T. and E. T.
SCOTT, JOHN G.Age, 21 years. Enlisted, October 15, 1862, at Chatham; mustered in as private, Co. C, February 17, 1863, to serve three years; appointed corporal, October 15, 1862, reduced, date not stated; mustered out with company, July 19, 1865, at Raleigh, N.C.
SCOVAL, STEPHEN, see Schovel, Stephen. SCOVILLE, GEORGE.Age, 21 years. Enlisted, March 24, 1863, at New York, as private, Co. F, to serve three years; deserted, previous to muster in of company, April 28, 1863; also borne as Scowl. SCRACE, WILLIAM R.Age, 21 years. Enlisted, October 28, 1863, at Buffalo; mustered in as private, Co. M, November 24, 1863, to serve three years; appointed corporal, August 12, 1864; in confinement upon muster out of company, July 18, 1865. SCRANTON, CHARLES.Age, 18 years. Enlisted, December 26, 1862, at Clifton Park; mustered in as bugler, Co. E, March 31, 1868, to serve three years; discharged as of Co. C, June 6, 1865, from New York Hospital at Albany. SCRIBER, CHRISTIAN.Age, 42 years. Enlisted, September 5, 1863, at Buffalo; mustered in as private, Co. L, September 25, 1863, to serve three years; appointed corporal, 1 20, 1865; mustered out with company, July 19, 1865, at Raleigh, N.C.
SCRIVEN, WILLIAM W.Age, 25 years. Enlisted, September 1, 1864, at Troy; mustered in as private, Co. E, September 8, 1864, to serve one year; discharged with detachment, June 14, 1865, at Raleigh, N.C.
SCRIVER, BENJAMIN.Age, 21 years. Enlisted, November 21, 1862, at Hudson; mustered in as private, Co. C, February 17, 1863, to serve three years; no further record. SCRIVER, JACOB IRA.Age, 22 years. Enlisted, July 3, 1863, at Syracuse; mustered in as private, Co. I, September 2, 1863, to serve three years; in confinement in Fort Palmer, undergoing sentence, April, 1864; deserted, May 31, 1865, at Tarboro, N.C.; also borne as Serion, Jacob J.
SCULLY, WILLIAM, see Schully, William. SCULLY, WILLIAM.Age, 18 years. Enlisted, November 28, 1862, at Buffalo; mustered in as private, Co. H, November 28, 1862, to serve three years; transferred to Co. D, May 20, 1863; mustered out, July 19, 1865, at Raleigh, N.C. SEAMAN, HARRY G.Age, 21 years. Enlisted, September 9, 1864, at Goshen; mustered in as private, Co. I, September 9, 1864, to serve one year; appointed bugler, date not stated; returned to ranks, date not recorded; discharged, June 23, 1865, at Tarboro, N.C., under General Order No. 83. SEAMAN, SERVIS, see Lehman, Lewis. SEAVEY, NORMAN D.Age, 21 years. Enlisted, December 8, 1862, at New York; mustered in as private, Co. E, March 31, 1863, to serve three years; transferred to Co. C, May 20, 1863; appointed corporal, date not stated; reduced, June 1, 1864; mustered out with company, July 19, 1865, at Raleigh, N.C.; also borne as De Savey, and Seavoy. SEE, FREDERICK.Age, 41 years. Enlisted, September 8, 1862, at Austerlitz; mustered in as private, Co. C, February 17, 1863, to serve three years; appointed wagoner, February 17, 1863; discharged, June 23, 1865, at Greenboro, N.C.
SEEKINS, ANDREW A.Age, 20 years. Enlisted, September 17, 1864, at Mount Morris; mustered in as private, Co. h, September 17, 1864, to serve one year; discharged, June 23, 1865, under General Order No. 83; also borne as Serkins. SEIBERT, NICHOLAS.Age, 35 years. Enlisted, May 13, 1863, at New York; mustered in as private, Co. D, May 13, 1863, to serve three years; transferred to Co. C, May 20, 1863; appointed corporal, January 1, 1864; sergeant, date not stated; killed in action, June 24, 1864 at Sneads Ferry. SENS, GUSTORF.Age, 36 years. Enlisted, December 3, 1862, at New York; mustered in as private, "unassigned," December 3, 1862, to serve three years; no further record. SERKINS, ANDREW A., see Seekins, Andrew A.
SERVIS, LANSING.Age, 32 years. Enlisted, September 10, 1864, at Syracuse; mustered in as private, Co. G, September 10, 1864, to serve one year; discharged, June 23, 1865, per General Order No. 83, Adjutant-Generals Office. SEYMOUR, JOHN.Age, 28 years. Enlisted, August 8, 1863, at Buffalo; mustered in as private, Co. H, August 27, 1863, to serve three years; appointed corporal, date not stated; reduced, date not recorded; mustered out with company, July 19, 1865, at Raleigh, N.C.
SEYMOUR, MILTON W.Age, 40 years. Enlisted, September 30, 1864, as Ossian. mustered in as private, Co. b, October 3, 1864, to serve one year; transferred to Co. F, December 23, 1864; discharged, June 23, 1865, at Tarboro, N.C., per General Order No. 83, Adjutant-Generals Office; also borne as Seymour, Milton H., and Milton L.
SHAFER, CHARLES H.Age, 34 years. Enlisted, November 11, 1863, at Buffalo; mustered in as private, Co. M, November 24, 1863, to serve three years; mustered out with company, July 19, 1865, at Raleigh, N.C.; also borne as Schafer. SHAMBERGER, JOHN.Age, 18 years. Enlisted, November 12, 1862, at Buffalo; mustered in as private, Co. M, November 24, 1863, to serve three years; in confinement upon muster out of company, July 19, 1865. SHAMLEY, WILLIAM.Age, 30 years. Enlisted, August 18, 1862, at Oswego; mustered in as private, Co. B, November 19, 1862, to serve three years; captured, March 11, 1865, at Cove Creek, N.C.; reported for duty, June 9, 1865; mustered out with company, July 19, 1865, at Raleigh, N.C.
SHANLEY, JOHN.Age, 23 years. Enlisted, December 12, 1862, at Buffalo; mustered in as private, Co. D, December 12, 1862, to serve three years; no further record. SHANNON, HUGH.Age, not stated. Enlisted, September 16, 1864, at Poughkeepsie; mustered in as private, Co. L, September 16, 1864, to serve three years; discharged, June 20, 1865, per General Order 85, Adjutant-Generals Office. SHANNON, JOSEPH.Age, 30 years. Enlisted, November 1, 1862, at Troy; mustered in as private, Co. B, March 31, 1863, to serve three years; reported in confinement at Albany jail; sick at muster in of company; transferred to Co. C, date not stated; deserted, May 21, 1863, from Staten Island, N.Y.
SHANNON, RICHARD.Age, 35 years. Enlisted, as substitute, August 31, 1864, at Albany; mustered in as private, Co. G, August 31, 1864, to serve one year; discharged, June 23, 1865, per General Order 83, Adjutant-Generals Office. SHARMAN, JOHN.Age, 30 years. Enlisted, March 31, 1863, at Buffalo; mustered in as private, Co. E, March 31, 1863, to serve three years; transferred to Co. D, May 20, 1863; mustered out, July 19, 1865, at Raleigh, N.C.; also borne as Shuman. SHAW, BENJAMIN.Age, 26 years. Enlisted, April 11, 1863, at Buffalo; mustered in as private, Co. H, April 11, 1863, to serve three years; no further record. SHAW, CHARLES.Age, 23 years. Enlisted, November 12, 1864, at Fulton; mustered in as private, Co. C, November 12, 1864, to serve one year; appointed corporal, January 9, 1865; mustered out with company, July 19, 1865, at Raleigh, N.C.
SHAW, GEORGE.Age, 34 years. Enlisted, February 3, 1863, at Buffalo; mustered in as private, Co. E, February 3, 1863, to serve three years; no further record. SHAY, AMERICUS.Age, 34 years. Enlisted, December 11, 1862, at West Troy; mustered in as private, Co. E, March 31, 1863, to serve three years; transferred to Co. C, May 20, 1863; appears as wagoner in quartermaster department, October, 1863; returned as private, date not stated; discharged for disability, May 31, 1865, at Rochester, N.Y.; also borne as Shea. SHEA, AMERICUS, see Shay Americus. SHEAR, MORRIS B.Age, 18 years. Enlisted, September 14, 1863, at Buffalo; mustered in as private, Co. L, September 25, 1863, to serve three years; discharged for disability, May 30, 1864, at Newark, N.J.
SHEEHAN, CORNELIUS.Age, 22 years. Enlisted, March 26, 1863, at New York; mustered in as private, Co. F, April 28, 1863, to serve three years; deserted, May 30, 1863, from Camp Washington, Staten Island. SHEEHAN, JEREMIAH.Age, 39 years. Enlisted, December 26, 1862, at Buffalo; mustered in as private, Co. D, December 27, 1862, to serve three years; no further record. SHEEHAN, PATRICK.Age, 30 years. Enlisted, July 9, 1863, at New York; mustered in as private, Co. I, September 2, 1863, to serve three years; mustered out with company, July 19, 1865, at Raleigh, N.C.; prior service in Forty-second New York Volunteer Infantry. SHEEHY, EDWARD.Age, 18 years. 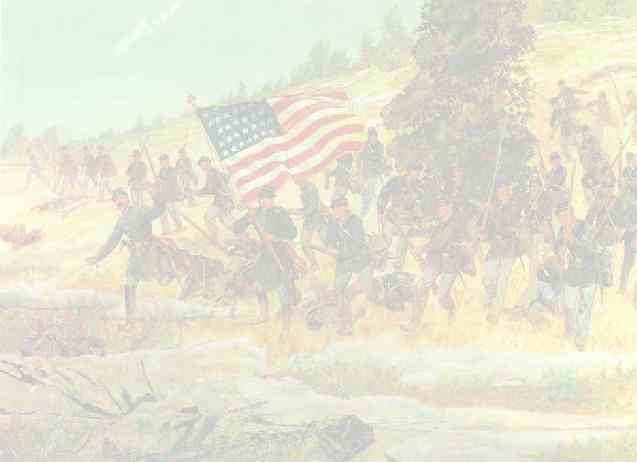 Enlisted, August 25, 1863, at Troy, as private, Co. I, to serve three years; name crossed-on muster-in-roll; no further record. SHEHAN, BRYAN.Age, 31 years. Enlisted, November 14, 1862, at White Church; mustered in as private, Co. A, March 31, 1863, to serve three years; transferred to Co. B, May 20, 1863; captured, April 11, 1865, at Goldsboro, N.C.; released, April 15, 1865; discharged, June 27, 1865, at Annapolis, Md. ; also borne as Sheehan. SHEPPARD, ALLEN R.Age, 22 years. Enlisted, February 21, 1863, at New York; mustered in as corporal, Co. F, April 28, 1863, to serve three years; transferred to Co. G, date not stated; appointed sergeant, July 1, 1863; reduced, August 17, 1863; appointed corporal, January 9, 1864; reduced, July 5, 1864; died, September 23, 1864, in Foster General Hospital, New Berne, N.C.; also borne as Shephard. SHEPHERD, WILLIAM H.Age, 25 years. Enlisted, December 5, 1862, at Dunkirk; mustered in as private, Co. L, December 5, 1862, to serve three years; transferred to Co. E, May 20, 1863; mustered out with company, July 19, 1865, at Raleigh, N.C.; also borne as Sheppard. SHEPHARDSON, CHARLES.Age, 21 years. Enlisted, September 29, 1864, at Albany; mustered in as private, Co. M, September 29, 1864, to serve one year; died of disease, October 31, 1864, at Regimental Hospital, New Berne, N.C.
SHERIDAN, JAMES.Age, 26 years. Enlisted, January 22, 1863, at Buffalo; mustered in as private, Co. E, January 23, 1863, to serve three years; no further record. SHERIDAN, MICHAEL.Age, 25 years. Enlisted, December 1, 1862, at Fonda; mustered in as private, Co. E, March 31, 1863, to serve three years; transferred to Co. C, May 20, 1863; deserted, May 21, 1863, from Staten Island, N.Y.
SHERIDAN, PATRICK.Age, 22 years. Enlisted, November 28, 1862, at Buffalo; mustered in as private, Co. H, November 29, 1862, to serve three years; no further record. SHERIDAN, RICHARD W.Age, 31 years. Enlisted, January 19, 1864, at New York; mustered in as private, Co. A, January 19, 1864, to serve three years; killed, April 20, 1864, in action at Plymouth, N.C.
SHERIDAN, THOMAS.Age, 22 years. Enlisted, February 3, 1863, at Buffalo; mustered in as private, Co. E, February 4, 1863, to serve three years; no further record. SHERMAN, FRANKLIN.Age, 20 years. Enlisted, October 7, 1864, at Buffalo; mustered in as private, Co. B, October 7, 1864, to serve one year; deserted, July 4, 1865, at Raleigh, N.C.
SHERMAN, JOHN M.Age, 21 years. Enlisted, September 16, 1863, at Buffalo; mustered in as private, Co. L, September 25, 1863, to serve three years; killed, February 2, 1864, in action at Evans Mills; prior service in Thirty-fifth New York Volunteers. SHERWOOD, MYRON B.Age, 44 years. Enlisted, August 15, 1864, at Olean; mustered in as private, Co. L, August 15, 1864, to serve one year; mustered out, May 23, 1865, at New Berne, N.C., under General Order No. 83, Adjutant-Generals Office. SHERWOOD, NOAH H.Age, 33 years. Enlisted, November 8, 1862, at Stockport; mustered in as private, Co. C, February 17, 1863, to serve three years; discharged for disability, May 26, 1864, at New York. SHILLING, FRANK.Age, 31 years. Enlisted, October 5, 1864, at Wheatfield; mustered in as private, Co. M, October 5, 1864, to serve one year; in confinement upon muster out of company, July 19, 1865; no further record. SHLASING, PAUL.Age, 22 years. Enlisted, November 25, 1862, at Buffalo; mustered in as private, Co. H, November 25, 1862, to serve three years; no final record; also borne as Slashing. SHOARZ, HENRY M.Age, 29 years. Enlisted, September 5, 1864, at Troy; mustered in as private, "unassigned," September 12, 1864, to serve one year; mustered out, May 8, 1865, at Harts Island, New York Harbor, as Henry M. Shores. SHORES, HENRY M., see Shoarz, henry M.
SHOT, JOHN.Age, 22 years. Enlisted, October 8, 1864, at Amherst; mustered in as private, Co. L, October 8, 1864, to serve three years; mustered out with company, July 19, 1865, at Raleigh, N.C.
SHUMAN, JOHN, see Sharman, John. SICKLES, JAMES.Age, 19 years. Enlisted, June 29, 1863, at Troy, as private, "unassigned," to serve three years; no further record. SICKLES, LANSING.Age, 23 years. Enlisted, December 8, 1862, at Hudson, as private, "unassigned," to serve three years; no further record. SIEFFERT, CHARLES L.Age, 21 years. Enlisted, August 24, 1863, at Buffalo; mustered in as private, Co. H, August 27, 1863, to serve three years; appointed corporal, December 17, 1863; captured, March 8, 1865, at Wises Forks; N.C.; mustered out, August 21, 1865, at New York city; prior service in Co. H, Twenty-seventh New York Volunteers; also borne as Seiffert. SIGWALD, JOHN.Age, 18 years. Enlisted, November 16, 1863, at Buffalo; mustered in as private, Co. M, November 24, 1863, to serve three years; in confinement upon muster out of company, July 19, 1865; no further record. SILK, PATRICK.Age, 31 years. Enlisted, August 14, 1862, at Oswego; mustered in as private, Co. A, November 19, 1862, to serve three years; died, March 11, 1865, in Foster General Hospital, New Berne, N.C.
SILVERVALE, JOHN H.Age, 25 years. Enlisted, December 8, 1862, at Hudson, as private, "unassigned," to serve three years; no further record. SIMMONS, JOHN B.Age, 24 years. Enlisted, August 12, 1862, at Oswego; mustered in as sergeant, Co. A, November 19, 1862, to serve three years; reduced to ranks, May 20, 1863; mustered out with company, July 19, 1865, at Raleigh, N.C.; also borne as Simons. SIMONS, JACOB.Age, 21 years. Enlisted, August 1, 1863, at Buffalo; mustered in as private, Co. H, August 27, 1863, to serve three years; died of disease, December 15, 1864, in Regimental Hospital, New Berne, N.C.
SIMONS, JOSIAH.Age, 21 years. Enlisted, December 4, f1862, at New York; mustered in as private, "unassigned," December 4, 1862, to serve three years; no further record. ; also borne as Isaiah. SIMONSON, PETER.Age, 24 years. Enlisted, September 8, 1864, at Albany; mustered in as private, Co. E, September 10, 1864, to serve one year; captured near Plymouth, N.C., February 12, 1865; discharged, June 14, 1865, at Raleigh, N.C.; also borne as Symonson. SIMPSON, JOHN.Age, 21 years. Enlisted, December 26, 1862, at Oswego; mustered in as private, Co. b, March 31, 1863, to serve three years; no further record. SINCLAIR, GEORGE H., see St. Clair, George H.
SINCLAIR, WILLIAM.Age, 29 years. Enlisted, July 5, 1864, at Troy; mustered in as private, Co. C, July 5, 1864, to serve three years; claimed, as a deserter, by the Ninety-third New York Infantry, and borne as a bounty jumper, in December 1864. SINGLETON, THOMAS.Age, 35 years. Enlisted, August 14, 1862, at Oswego; mustered in as private, Co. A, November 19, 1862, to serve three years; captured, April 20, 1864, at Plymouth, N.C., and confined at Andersonville, Ga.; released at Northeast Bridge, N.C., March 1, 1865; mustered out, June 26, 1865. SINK, GEORGE.Age, 28 years. Enlisted, September 21, 1864, at Eden; mustered in as private, Co. K, September 21, 1864, to serve one year; discharged, June 14, 1865, at Raleigh, N.C.
SIPPETTS, JOHN W., see Tippetts, John W.
SIZER, ANDREW.Age, 39 years. Enlisted, December 9, 1863, at Brooklyn; mustered in as private, Co. B, date not stated; mustered out, August 19, 1865, at New York, under telegraph order, etc. ; also borne as Zizer, and Zeizer. SKELTON, WILLIAM.Age, 20 years. Enlisted, June 23, 1863, at New York; mustered in as private, Co. G, August 7, 1863, to serve three years; appointed corporal, October 24, 1863; sergeant, December 28, 1863; reduced, March 1, 1864; absent in arrest, April 30, 1864, at Provost Marshals prison, New Berne, N.C., since March 27, 1864; sentenced to eight months hard labor; in confinement at Fort Washington, with loss of pay during confinement; died of disease, October 21, 1864, at Fort Totten, New Berne, N.C.
SKILLMAN, THEODORE.Age, 43 years. Enlisted, January 7, 1863, at Buffalo; mustered in as private, Co. L, January 7, 1863, to serve three years; transferred to Co. E, May 20, 1863; reported as teamster; died of disease, October 25, 1864, at Regimental Hospital, Camp Palmer, N.C.
SKINNER, JAMES P.Age, 23 years. Enlisted, October 10, 1864, at Buffalo; mustered in as private, Co. E, October 11, 1864, to serve three years; appointed blacksmith, December, 1864; mustered out with company, July 19, 1865, at Raleigh, N.C.
SKINNER, WILLIAM.Age, 21 years. Enlisted, August 19, 1863, at Buffalo; mustered in as private, Co. K, September 10, 1863, to serve three years; mustered out with company, July 19, 1865, at Raleigh, N.C.
SLAMMONDS, CHARLES, see Stamonds, Charles. SLAMMONDS, JOHN, see Stannonds, John. SLASHING, PAUL, see Shlasing, Paul. SLATER, FRED W.Age, 22 years. Enlisted, August 22, 1862, at Oswego; mustered in as private, Co. B, November 19, 1862, to serve three years; appointed corporal, November 20, 1862; reduced, May 20, 1863; appointed corporal, June 20, 1863; sergeant, March 19, 1865; mustered out with company, July 19, 1865, at Raleigh, N.C.
SLATER, PATRICK.Age, 21 years. Enlisted as private, "unassigned," August 20, 1863, at Buffalo, to serve three years; no further record. SLAUGHTER, JACOB B.Age, 21 years. Enlisted, November 28, 1862, at Buffalo; mustered in as private, Co. H, November 28, 1862, to serve three years; ; also borne as Slaught; no further record. SMALLING, ISAAC.Age, not stated. Borne as a recruit of Co. C, in August, 1864; killed on picket duty, September 20, 1864, at Pine Tree Station, N.C.
SMILEY, DAVID.Age, 42 years. Enlisted, October 6, 1864, at West Sparta; mustered in as private, Co. L, October 6, 1864, to serve one year; mustered out with company, July 19, 1865, at Raleigh, N.C.
SMITH, ALBERT.Age, 25 years. Enlisted, October 21, 1864, at Belfast; mustered in as private, Co. L, October 21, 1864, to serve three years; mustered out with company, July 19, 1865, at Raleigh, N.C.
SMITH, ALFRED R.Age, 19 years. Enlisted, August 23, 1862, at Oswego; mustered in as private, Co. B, November 19, 1862, to serve three years; discharged, to date July 1, 1865. SMITH, AMOS.Age, 18 years. Enlisted, August 20, 1863, at Buffalo; mustered in as private, Co. K, September 10, 1863, to serve three years; captured, February 1, 1864; mustered out with company, July 19, 1865, at Raleigh, N.C.
SMITH, ANDREW.Age, 23 years. Enlisted, December 13, 1862, at New York; mustered in as private, "unassigned," December 13, 1862, to serve three years; no further record. SMITH, AGUSTUS.Age, 25 years. Enlisted, May 4, 1863, at Syracuse; mustered in as private, Co. G, August 7, 1863, to serve three years; deserted, August 27, 1863, at Staten Island. SMITH, CHARLES.Age, 21 years. Enlisted, December 5, 1862, at Dunkirk; mustered in as private, Co. L, December 5, 1862, to serve three years; no further record. SMITH, CHARLES.Age, 38 years. Enlisted, December 2, 1862, at New York; mustered in as private, "unassigned," December 2, 1862, to serve three years; no further record. SMITH, CHARLES.Age, 25 years. Enlisted, January 30, 1863, at New York; mustered in as private, Co. F, April 28, 1863, to serve three years; captured on raid at Tarboro, N.C., July 20, 1863; died, while a prisoner, at Andersonville, Ga.
SMITH, CHARLES.Age, 22 years. Enlisted, August 21, 1862, at Oswego; mustered in as private, Co. A, November 19, 1862, to serve three years; transferred to Co. B, May 20, 1863; appointed corporal, May 1, 1864; deserted, July 1, 1865, at Halifax, N.C.
SMITH, CHARLES W.Age, 18 years. Enlisted, August 25, 1863, at Buffalo; mustered in as a teamster, Co. L, September 25, 1863, to serve three years; name erased from muster-in roll of company. SMITH, DANIEL.Age, 37 years. Enlisted, September 25, 1863, at Buffalo; mustered in as private, Co. L, September 25, 1863, to serve three years; appointed corporal, October 27, 1863; reduced, December 30, 1863; mustered out with company, July 19, 1865, at Raleigh, N.C.
SMITH, DAVID.Age, 22 years. Enlisted, August 6, 1863, at Buffalo; mustered in as private, "unassigned," August 7, 1863, to serve three years; name erased from muster-in roll of Co. K.
SMITH, DAVID. - Age, 28 years. Enlisted, October 25, 1862, at Austerlitz, as private, "unassigned," to serve three years; no further record. SMITH, ENOCH.Age, 35 years. Enlisted, October 27, 1862, at Claremont; mustered in as private, Co. C, February 17, 1863, to serve three years; deserted, May 21, 1863, from Staten Island, N.Y.; also borne as Smith, Eunic. SMITH, EZRA.Age, 31 years. Enlisted, August 31, 1863, at Buffalo; mustered in as private, Co. L, September 25, 1863, to serve three years; appointed farrier, October 1, 1863; reduced, May 11, 1864; appointed farrier, September 26, 1864; mustered out with company, July 19, 1865, at Raleigh, N.C.
SMITH, EZRA C.Age, 44 years. Enlisted, September 6, 1864, at Albany; mustered in as private, Co. D, September 6, 1864, to serve one year; deserted, January 1, 1865, while on furlough. SMITH, FREDERICK.Age, 21 years. Enlisted, October 31, 1862, at Albany; mustered in as private, Co. C, February 17, 1863, to serve three years; no further record. SMITH, GEORGE.Age, 18 years. Enlisted, September 2, 1863, at Buffalo; mustered in as corporal, Co. L, September 25, 1863, to serve three years; appointed sergeant, August 15, 1864; captured, March 28, 1865, at Hookerton, N.C.; released, May 5, 1865; mustered out, June 30, 1865, at New York city. SMITH, GEORGE.Age, 21 years. Enlisted, November 1, 1862, at Claremont, as private, "unassigned," to serve three years; no further record. SMITH, GEORGE.Age, 18 years. Enlisted, April 22,1 863, at Buffalo; mustered in as private, Co. E, April 22, 1863, to serve three years; transferred to Co. D, May 20, 1863; deserted, may 29, 1863, from Camp Washington, State Island. SMITH, HENRY.Age, 23 years. Enlisted, January 3, 1863, at Buffalo; mustered in as private, Co. L, January 3, 1863, to serve three years; no final record. SMITH, HENRY R.Age, 23 years. Enlisted, January 3, 1863, at Buffalo; mustered in as private, Co. L, January 3, 1863, to serve three years; no final record. SMITH, HENRY V.Age, not stated. Enlisted, August 20, 1863, at New York; mustered in as sergeant, Co. I, September 2, 1863, to serve three years; wounded in action, November 23, 1863, near James River, N.C.; discharged, September 22, 1864, at General Hospital, New Berne, N.C.; prior service in First New York Cavalry. SMITH, ISAAC J.Age, 35 years. Enlisted, May 1, 1863, at New York; mustered in as private, Co. F, May 2, 1863, to serve three years; deserted, August 8, 1863, while on detached service, at Evans Mills, N.C.
SMITH, JAMES.Age, 28 years. Enlisted, September 9, 1863, at Buffalo, as private, "unassigned," to serve three years; no further record. SMITH, JAMES.Age, 21 years. Enlisted, October 8, 1864, at Amherst; mustered in as private, Co. E, October 8, 1864, to serve one year; mustered out with company, July 19, 1865, at Raleigh, N.C.
SMITH, JOHN.Age, 22 years. Enlisted, March 27, 1863, at New York, as private, Co. F, to serve three years; deserted, previous to muster in of company, April 28, 1863. SMITH, JOHN.Age, 20 years. Enlisted, September 2, 1863, at Buffalo; mustered in as private, Co. L, September 25, 1863, to serve three years; transferred to Co. A, January 1, 1865; missing and wounded in action, March 8, 1865, at Kingston, N.C.; absent, sick in Northern Hospital, upon muster out of company, July 19, 1865; no further record. SMITH, JOHN.Age, 27 years. Enlisted, July 6, 1863, at Buffalo; mustered in as private, Co. K, September 10, 1863, to serve three years; deserted, September 22, 1863, from Camp Sprague, Staten Island. SMITH, JOHN.Age, 28 years. Enlisted, September 12, 1863, at Buffalo; mustered in as private, Co. D, September 24, 1863, to serve three years; discharged, June 23, 1865, at Tarboro, N.C.
SMITH, JOHN.Age, 36 years. Enlisted, January 22, 1863, at Buffalo; mustered in as private, Co. F, January 22, 1863, to serve three years; transferred to Co. E, May 20, 1863; absent, sick in Northern Hospital, upon muster out of company, July 19, 1865; no further record. SMITH, JOHN.Age, 28 years. Enlisted, December 15, 1862, at New York; mustered in as private, Co. E, March 31, 1863, to serve three years; transferred to Co. F, May 20, 1863; missing in action, April 20, 1864, at Plymouth, N.C.; escaped and paroled prisoner of war, at Annapolis, Md., February, 1865; appointed corporal, June 9, 1865; mustered out with company, July 19, 1865, at Raleigh, N.C.
SMITH, JOHN.Age, 27 years. Enlisted, July 6, 1863, at Buffalo, as private, Co. H, to serve three years; deserted, August 26, 1863, from rendezvous, Buffalo. SMITH, JOHN.Age, 30 years. Enlisted, January 5, 1863, at Buffalo; mustered in as private, Co. L, January 7, 1863, to serve three years; no further record. SMITH, JOHN.Age, 28 years. Enlisted, December 15, 1862, at New York; mustered in as private, "unassigned," December 15, 1862, to serve three years; no further record. SMITH, JOHN.Age, 25 years. Enlisted, December 9, 1862, at New York; mustered in as private, "unassigned," December 9, 1862, to serve three years; no further record. SMITH, JOHN.Age, 20 years. Enlisted, February 24, 1864, at Troy; mustered in as private, "unassigned," February 25, 1864, to serve three years; no further record. SMITH, JOHN.Age, 19 years. Enlisted, September 19, 1864, at Buffalo; mustered in as private, "unassigned," September 19, 1864, to serve three years; no further record. SMITH, JOHN.Age, 21 years. Enlisted, November 18, 1862, at Buffalo; mustered in as private, Co. H, November 18, 1862, to serve three years; no further record. SMITH, JOSEPH, see Schmidt, Joseph. SMITH, JOSEPH.Age, 18 years. Enlisted, August 10, 1863, at Buffalo; mustered in as private, Co. H, August 27, 1863, to serve three years; captured, March 8, 1865, at Wises Forks, N.C.; returned to duty, June 20, 1865; mustered out with company, July 19, 1865, at Raleigh, N.C.
SMITH, LOUIS.Age, 18 years. Enlisted, October 30, 1863, at Buffalo; mustered in as private, Co. M, November 24, 1863, to serve three years; in confinement upon muster out of company, July 19, 1865; no further record. SMITH, ROBERT.Age, 21 years. Enlisted, August 13, 1863, at Buffalo; mustered in as private, Co. H, August 27, 1863, to serve three years; mustered out with company, July 19, 1865, at Raleigh, N.C.
SMITH, SOLOMON H.Age, 36 years. Enlisted, September 10, 1864, at Farmington; mustered in as private, Co. B, September 10, 1864, to serve one year; captured, March 11, 1865, at Cold Creek, N.C.; confined in Libby Prison; released at Aikens Landing, March 26, 1865; mustered out, June 27, 1865, at Annapolis, Md. SMITH, THOMAS.Age, 21 years. Enlisted, September 21, 1864, at Aneram; mustered in as private, Co. L, September 21, 1864, to serve one year; mustered out, June 20, 1865, under General Order 85, Adjutant-Generals Office. SMITH, THOMAS.Age, 22 years. Enlisted, February 5, 1863, at Buffalo; mustered in as private, Co. E, February 5, 1863, to serve three years; no further record. SMITH, TRUMAN.Age, 35 years. Enlisted, September 17, 1862, at Volney; mustered in as farrier and blacksmith, Co. B, November 19, 1862, to serve three years; mustered out with company, July 19, 1865, at Raleigh, N.C.
SMITH, WILLIAM.Age, 19 years. Enlisted, December 19, 1862, at New York; mustered in as private, "unassigned," December 19, 1862, to serve three years; no further record. SMITH, WILLIAM.Age, 26 years. Enlisted, January 21, 1863, at Buffalo; mustered in as private, Co. E, January 21, 1863, to serve three years; no further record. SMITH, WILLIAM J.Age, 24 years. Enlisted, December 13, 1862, at Buffalo; mustered in as corporal, Co. E, December 13, 1862, to serve three years; no further record. SMITH, WILLIAM T.Age, 24 years. Enlisted, January 12, 1864, at New York; mustered in as private, Co. E, January 12, 1864, to serve three years; appointed corporal, July 7, 1864; sergeant, October 27, 1864; captured, March 22, 1865; mustered out with company, July 19, 1865, at Raleigh, N.C. SNOW, HUMPHREY W.Age, 26 years. Enlisted, August 20, 1863, at Buffalo; mustered in as private, Co. K, September 10, 1863, to serve three years; appointed corporal, November 23, 1863; borne as sergeant, June 30, 1865; mustered out with company, July 19, 1865, at Raleigh, N.C.
SNYDER, ALEXANDER.Age, 31 years. Enlisted, September 22, 1862, at Austerlitz; mustered in as corporal, CO. I, February 17, 1863, to serve three years; sergeant, date not given; reduced and transferred to Co. C, May 20, 1863; mustered out with detachment, July 7, 1865, under General Order No. 83, at Greensboro, N.C.; also borne as Schneider. SNYDER, JUSDON F.Age, 22 years. Enlisted, August 20, 1862, at Grandy; mustered in as private, Co. B, November 19,1 862, to serve three years; appointed corporal, June 20, 1863; captured, April 13, 1865, at Goldsboro; confined at Greenville, N.C.; released, April 15, 1865, at Kingston, N.C.; discharged, June 27, 1865, General Order No. 77, Adjutant-Generals Office, at Camp Parole, Md. SNYDER, LE GRAND T.Age, 21 years. Enlisted, October 27, 1863, at Buffalo; mustered in as private, Co. M, November 24, 1863, to serve three years; appointed sergeant, same date; reduced to ranks, January 13, 1864; mustered out, July 15, 1865, at Washington, D.C.
SNYDER, LEVI.Age, 21 years. Enlisted, April 27, 1863, at Rondout; mustered in as quartermaster sergeant, Co. G, June 26, 1863, to serve three years; died, August 5, 1863, at Sprague Barracks. SOMERS, EDWARD.Age, 26 years. Enlisted, as a private, "unassigned," November 7, 1862, at Claremont; to serve three years; no further record. SOMERS, THEO. B.Age, 19 years. Enlisted, March 2, 1864, at Troy; mustered in as private, "unassigned," March 5, 1864, to serve three years; mustered out, May 8, 1865, at Harts Island, New York Harbor. SOULIERE, ALFRED.Age, 18 years. Enlisted, December 18, 1862, at Buffalo; mustered in as sergeant, Co. D, December 18, 1862, to serve three years; no further record. SOUTHARD, JOHN O.Age, 18 years. Enlisted, April 18, 1863, at Buffalo; mustered in as private, Co. E, April 18, 1863, to serve three years; transferred to Co. D, May 20, 1863; mustered out with company, July 19, 1865, at Raleigh, N.C.
SOUTHARD, WARD.Age, 18 years. Enlisted, August 20, 1862, at Fulton; mustered in as private, Co. A, August 22, 1862, to serve three years; absent, sick upon muster in of company, November 19, 1862; no further record. SPAHN, JOHN.Age, 21 years. Enlisted, November 2, 1863, at Buffalo; mustered in as private, Co. M, November 24, 1863, to serve three years; appointed corporal, same date; sergeant, May 2, 1864; in confinement upon muster out of company, July 19, 1865; prior service in Twenty-first New York Volunteer Infantry. SPALDING, NEWELL. Age, 28 years. Enlisted, July 8, 1863, at Buffalo; mustered in as sergeant, Co. h, August 27, 1863, to serve three years; discharged for disability, December 12, 1863; prior service in Twenty-first New York Volunteers. SPAWNBERGH, JOHN.Age, 48 years. Enlisted, November 3, 1862, at Hudson; mustered in as private, Co. C, February 17, 1863, to serve three years; appointed corporal, May 20, 1863, sergeant, June 30, 1863; reduced to ranks, June 1, 1864; mustered out, May 15, 1865, per telegraph order, War Department, May 4, 1865, at Davids Island, New York Harbor; also borne as Spaunburgh; also born as Spanburgh. SPEAKMAN, WILLIAM.Age, 31 years. Enlisted, January 2, 1864, at New York; mustered in as private, "unassigned," January 2, 1864, to serve three years; no further record. SPEES, PETER.Age, 22 years. Enlisted, August 18, 1863, at Buffalo; mustered in as wagoner, Co. H, August 27, 1863, to serve three years; mustered out with company, July 19, 1865, at Raleigh, N.C.; prior service in Twenty-first New York Volunteers. SPENCER, ELIAS.Age, 21 years. Enlisted, October 10, 1864, at Buffalo; mustered in as private, Co. B, October 24, 1864, to serve three years; transferred to Co. F, December 23, 1864; mustered out, General Order No. 83, June 23, 1865, at Tarboro, N.C.
SPINK, RODERICK E.Age, 23 years. Enlisted, August 21, 1862, at Oswego; mustered in as second lieutenant, Co. E, April 8, 1863, to serve three years; discharged, to date June 23, 1864, at Amherst; mustered in as private, Co. K, Sep- borne as Frederick E. Not commissioned. SPINLOW, JOHN H.Age, 22 years. Enlisted, as private, Co. I, September 1, 1863, at New York, to serve three years; name erased on muster-in roll. SPITTLER, LUDWICH.Age, 24 years. Enlisted, September 23, 1864, at Amherst; mustered in as private, Co. K, September 23, 1864, to serve three years; mustered out, June 19, 1865, under General Order No. 38, etc., at Buffalo, N.Y.; also borne as Ludwick Spillter. STACK, CHARLES K., see Stok, Charles F.
STADDARD, ROBERT, see Stoddard, Robt. STAHL, FREDERICK.Age, 18 years. Enlisted, October 8, 1863, at Buffalo; mustered in as private, Co. M, November 24, 1863, to serve three years; mustered out with company, July 19, 1865, at Raleigh, N.C.
STAKER, JOHN H.Age, 42 years. Enlisted, September 4, 1863, at Buffalo; mustered in as private, Co. K, September 10, 1863, to serve three years; mustered out with company, July 19, 1865, at Raleigh, N.C.
STAMONDS, CHARLES.Age, 27 years. Enlisted, November 24, 1862, at Buffalo; mustered in as private, "unassigned," to serve three years; also borne as Slammonds; no further record. STANNONDS, JOHN.Age, 25 years. Enlisted, November 25, 1862, at Buffalo; mustered in as private, Co. H, November 25, 1862, to serve three years; also borne as Slammonds; no further record. STANTON, MARTIN.Age, 29 years. Enlisted, December 28, 1863, at New York; mustered in as private, Co. F, December 28, 1863, to serve three years; captured, April 20, 1864, at Plymouth, N.C.; exchanged, date not recorded; mustered out with company, July 19, 1865, at Raleigh, N.C.
STARKS, EMANUEL.Age, 19 years. Enlisted, August 4, 1863, at Troy; mustered in as private, Co. I, September 2, 1863, to serve three years; mustered out with company, July 19, 1865, at Raleigh, N.C.
STARNER, DANIEL.Age, 40 years. Enlisted, September 14, 1864, at Springwater; mustered in as private, Co. F, September 14, 1864, to serve one year; mustered out, June 23, 1865, at Tarboro, N.C.
STATTS, CORNELIUS, see Stauts, Cornelius. STAUBER, JOSEPH.Age, 18 years. Enlisted, October 6, 1863, at Buffalo; mustered in as private, Co. M, November 24, 1863, to serve three years; died of disease, January 5, 1864, at Govs Island Hospital, New York Harbor. STAUTS, CORNELIUS.Age, 18 years. Enlisted, September 5, 1863, at Buffalo; mustered in as private, Co. L, September 25, 1863, to serve three years; transferred to Co. A, January 1, 1865; mustered out with company, July 19, 1865, at Raleigh, N.C.; also borne as Statts. ST. CLAIR, GEORGE H.Age, 38 years. Enlisted as substitute, August 3, 1864, at New York; mustered in as private, Co. F, August 3, 1864, to serve three years; appointed corporal, March 8, 1865; sergeant, April 20, 1865; mustered out June 23, 1865, at Tarboro, N.C.; also borne as Sinclair. STEADERMAN, AUGUSTE, see Stederman, Auguste. STEARN, CHARLES H., see Stern, Charles H.
STEARNS, JACOB S.Age, 26 years. Enlisted, January 16, 1863, at Buffalo; mustered in as private, Co. E, January 17, 1863, to serve three years; no further record. STEARNS, MICHAEL A.Age, 26 years. Enlisted, December 15, 1862, at Buffalo; mustered in as private, Co. D, December 15, 1862, to serve three years; transferred to Co. G, date not recorded; mustered in as captain, Co. E, February 12, 1863; mustered out, to date June 23, 1863, as supernumerary. Not commissioned. STEDERMAN, AUGUSTE.Age, 43 years. Enlisted, January 2, 1863, at Buffalo; mustered in as bugler, Co. H, January 5, 1863, to serve three years; transferred to Co. E, May 20, 1863; died February 1, 1865, in Sisters Hospital, at Buffalo, N.Y.; also borne as Steaderman and Stoderman, and Steadman. STEIMAL, CHARLES. Age, 27 years. Enlisted, August 12, 1863, at Buffalo; mustered in as private, Co. H, August 27, 1863, to serve three years; appointed corporal, November 16, 1863; reduced, December 25, 1864; reinstated, April 21, 1865; mustered out with company, July 19, 1865, at Raleigh, N.C.
STEIN, CARL.Age, 30 years. Enlisted, November 25, 1862, at New York; mustered in as private, "unassigned," November 25, 1862, to serve three years; no further record. STEINER, AUGUST.Age, 32 years. Enlisted, December 23, 1862, at New York; mustered in as private, "unassigned," December 23, 1862, to serve three years; no further record. STEINER, LOUIS.Age, 25 years. Enlisted, January 9, 1864, at New York; mustered in as private, Co. E, January 9, 1864, to serve three years; mustered out, June 26, 1865, at Raleigh, N.C.
STEPHENS, CHARLES.Age, 21 years. Enlisted, December 27, 1862, at Buffalo; mustered in as first sergeant; Co. L, December 27, 1862, to serve three years; no final record. STEPHENS, JAMES W.Age, 19 years. Enlisted, November 19, 1862, at New York; mustered in as private, Co. E, March 31, 1863, to serve three years; no further record. STEPHENS, MELVIN F.Age, 35 years. Enlisted, August 25, 1862, at Granby; mustered in as private, Co. B, November 19, 1862, to serve three years; appointed quartermaster sergeant, November 26, 1863; reduced to ranks, September 15, 1864; appointed sergeant, November 1, 1864; mustered out with company, July 19, 1865, at Raleigh, N.C.; also borne as Melville S. Stephens. STERN, CHARLES H.Age, 18 years. Enlisted, August 25, 1863, at Buffalo; mustered in as private, Co. K, September 10, 1863, to serve three years; captured on scout, near New Berne, N.C., May 19, 1864; released, date not recorded; mustered out with company, July 19, 1865, at Raleigh, N.C.; also borne as Stearn. STEVENS, BRIGHAM.Age, 18 years. Enlisted, in Co. M, November 17, 1863, at Buffalo, to serve three years; name erased from muster-in roll of Co. M, signs enlistment as Stevens, Brisbane. STEVENS, CHARLES L.Age, 25 years. Enlisted, August 14, 1863, at Buffalo; mustered in as first sergeant, Co. K, September 10, 1863, to serve three years; reduced to ranks, October 14, 1863; died of disease, July 26, 1864, at Camp Palmer, N.C.; prior service in Twenty-first New York Volunteers. STEVENS, JOHN C.Age, 24 years. Enlisted, January 2, 1863, at Buffalo; mustered in as private, Co. D, January 2, 1863, to serve three years; no further record. STEWARD, ROBERT.Age, 24 years. Enlisted, October 28, 1864, at Ward; mustered in as private, Co. D, October 29, 1864, to serve one year; mustered out with company, July 19, 1865, at Raleigh, N.C.; also borne as Robert C. Steward. STEWART, CHARLES.Age, 27 years. Enlisted, November 3, 1862, at Albany; mustered in as private, Co. E, March 31, 1863, to serve three years; no further record. STEWART, CHARLES.Age, 27 years. Enlisted, January 21, 1863, at Buffalo; mustered in as private, Co. E, January 21, 1863, to serve three years; no further record. STHORN, JOHN.Age, 24 years. Enlisted, December 13, 1862, at Charlton; mustered in as private, Co. E, March 31, 1863, to serve three years; no further record. STICKLES, ROBERT.Age, 21 years. Enlisted, November 8, 1862, at Hudson; mustered in as private, Co. C, February 17, 1863, to serve three years; no further record. STICKNEY, ORREN.Age, 21 years. Enlisted, July 31, 1863, at Buffalo, mustered in as quartermaster sergeant, Co. L, September 25, 1863, to serve three years; reduced and appointed sergeant, March 16, 1864; deserted, July 4, 1865, at Halifax, N.C.; prior service in Twenty-first New York Volunteers. STODDARD, ROBERT.Age, 22 years. Enlisted, September 14, 1863, at Buffalo; mustered in as private, Co. L, September 25, 1863, to serve three years; appointed corporal, November 19, 1863; reduced, January 12, 1864; mustered out with company, July 19, 1865, at Raleigh, N.C.; also borne as Staddard. STOK, CHARLES F.Age, 28 years. Enlisted, August 8, 1863, at Buffalo; mustered in as bugler, Co. H, August 27, 1863, to serve three years; mustered out with company, July 19, 1865, at Raleigh, N.C.; also borne as Stack; prior service in Third United States Mounted Rifles. STOKELY, TECUMSEH.Age, 43 years. Enlisted, November 3, 1864, at Hartsville; mustered in as private, Co. D, November 3, 1864, to serve three years; mustered out with company, July 19, 1865, at Raleigh, N.C.
STONE, ANDREW C.Age, 21 years. Enlisted, September 8, 1863, at Buffalo; mustered in as private, Co. L, September 25, 1863, to serve three years; absent, with Howitzers section, at time company was mustered out, July 19, 1865; no further record. STONE, FRANK.Age, 18 years. Enlisted, June 19, 1863, at Buffalo; mustered in as private, Co. H, August 27, 1863, to serve three years; mustered out with company, July 19, 1865, at Raleigh, N.C.
STONE, MORTIMER.Age, 37 years. Enlisted, September 21, 1864, at Conesus; mustered in as private, Co. E, September 21, 1864, to serve one year; mustered out with detachment, June 14, 1865, at Raleigh, N.C.
STONE, ROBERT.Age, 21 years. Enlisted, December 17, 1862, at New York; mustered in as private, "unassigned," December 18, 1862, to serve three years; no further record. STONE, TRUMAN.Age, 22 years. Enlisted, September 21, 1864, at Conesus; mustered in as private, Co. L, September 21, 1864, to serve one year; mustered out, June 20, 1865, per General Order No. 85. STRATE, AUGUSTUS.Age, 32 years. Enlisted, September 21, 1864, at Hamburg; mustered in as private, Co. D, September 21, 1864, to serve three years; mustered out with company, July 19, 1865, at Raleigh, N.C.
STRONG, THOMAS.Age, 18 years. Enlisted, December 18, 1862, at Buffalo; mustered in as private, Co. D, December 18, 1862, to serve three years; no further record. STORK, MICHAEL.Age, 21 years. Enlisted, August 13, 1863, at Buffalo; mustered in as private, Co. K, September 10, 1863, to serve three years; mustered out with company, July 19, 1865, at Raleigh, N.C.
STURGEON, JAMES M.Age, 27 years. Enrolled, January 21, 1863, at Buffalo; mustered in as second lieutenant, Co. H, January 21, 1863, to serve three years; mustered in as first lieutenant, Co. D, to date January 8, 1864; transferred to Co. E, date not recorded; mustered out with company, July 19, 1865, at Raleigh, N.C.; also borne as James W. Commissioned second lieutenant, November 20, 1863, with rank from January 21, 1863, original; first lieutenant, January 8, 1864, with rank from November 5, 1863, vice Hock, promoted. STURGIN, JOHN.Age, 26 years. Enlisted, May 29, 1863, at Syracuse, mustered in as private, Co. G, August 7, 1863, to serve three years; discharged for disability, January 11, 1865, from Foster General Hospital, at New Berne, N.C.; also borne as Sturgeon. SULLIVAN, EDMOND.Age, 21 years. Enlisted as a private, "unassigned," July 6, 1863, at Troy, to serve three years; no further record. SULLIVAN, FRANK.Age, 19 years. Enlisted, November 21, 1862, at Buffalo; mustered in as private, Co. H, November 21, 1862, to serve three years; no further record. SULLIVAN, JAMES.Age, 18 years. Enlisted, December 6, 1864, at Buffalo; mustered in as private, Co. F, December 6, 1864, to serve three years; deserted, June 23, 1865, at Tarboro, N.C.
SULLIVAN, JEREMIAH.Age, 21 years. Enlisted, December 3, 1862, at Buffalo; mustered in as private, Co. H, December 3, 1862, to serve three years; no further record. SULLIVAN, JOHN.Age, 30 years. Enlisted, August 1, 1863, at Buffalo, to serve three years; name erased from muster-in roll of Co. K.
SULLIVAN, JOHN.Age, 25 years. Enlisted, July 2, 1863, at Buffalo; mustered in as private, "unassigned," July 2, 1863, to serve three years; no further record. SULLIVAN, JOHN.Age, 19 years. Enlisted, April 27, 1863, at Buffalo; mustered in as private, Co. E, April 27, 1863, to serve three years; transferred to Co. D< May 20, 1863; to the Navy, March 17, 1864. SULLIVAN, MICHAEL.Age, 25 years. Enlisted, July 8, 1863, at New York; mustered in as private, Co. G, August 7, 1863, to serve three years; appointed corporal, September 15, 1863, missing in action, February 3, 1865, at Colerain; reduced, February 13, 1865; in Parole Camp at Annapolis, Md., April 30, 1865; deserted, July 1, 1865, at Halifax, N.C.; prior service in Second United States Cavalry. SULLIVAN, PATRICK.Age, 21 years. Enlisted, December 24, 1862, at Buffalo; mustered in as private, Co. L, December 26, 1862, to serve three years; no further record. SULLIVAN, THOMAS.Age, 21 years. Enlisted, August 17, 1863, at Buffalo; mustered in as private, Co. K, September 10, 1863, to serve three years; captured, May 19, 1864, place not recorded; escaped and returned to duty, April 30, 1865; discharged, July 12, 1865, at Davids Island, New York Harbor; prior service in Tenth New York Volunteers. SULLIVAN, THOMAS.Age, 20 years. Enlisted, December 5, 1864, at Buffalo; mustered in as private, "unassigned," December 5, 1864, to serve three years; no further record. SULLIVAN, THOMAS A.Age, 22 years. Enlisted, October 21, 1864, at Ossian; mustered in as private, Co. L, October 21, 1864, to serve three years; absent on detached service at time company was mustered out, July 19, 1865; no further record. SULLIVAN, TIMOTHY.Age, 18 years. Enlisted as a private, August 10, 1863, at Buffalo, to serve three years; name erased from muster-in roll of Co. K.
SUMERS, GEORGE.Age, 21 years. Enlisted, December 1, 1862, at New York; mustered in as private, "unassigned," December 1, 1862, to serve three years; no further record. SWAN, THOMAS.Age, 22 years. Enlisted, November 19, 1862, at Cuba; mustered in as bugler, Co. E, March 31, 1863, to serve three years; transferred to Co. F, May 20, 1863; appointed chief bugler, June 4, 1863; mustered out with company, July 19, 1865, at Raleigh, N.C.
SWEENEY, BARNEY.Age, 32 years. Enlisted, November 24, 1862, at New York; mustered in as private, "unassigned," November 24, 1862, to serve three years; no further record. SWEENEY, DAVID.Age, 18 years. Enlisted as a private, in Co. F, March 24, 1863, at New York, to serve three years; deserted, previous to muster in of company, April 28, 1863. SWEET, AMOS.Age, 44 years. Enlisted, August 15, 1864, at Olean; mustered in as private, Co. L, August 15, 1864, to serve one year; captured, at Hookerton, N.C., April 4, 1865; released, May 5, 1865; mustered out, June 30, 1865, at New York city. SWEET, FRANK.Age, 28 years. Enlisted, August, 13, 1862, at Oswego; mustered in as private, Co. A, November 19, 1862, to serve three years; appointed corporal, November 20, 1862; reduced, May 20, 1863; reappointed corporal, date not recorded; appointed sergeant, July 21, 1863; missing in action, April 20, 1864, at Plymouth, N.C.; paroled prisoner, at Annapolis, Md., February 28, 1865; mustered out with company, July 19, 1865, at Raleigh, N.C.
SWEET, HENRY T.Age, 24 years. Enlisted, July 14, 1863, at Troy; mustered in as private, Co. I, September 2, 1863, to serve three years; appointed sergeant, date not recorded; mustered in as second lieutenant, Co. B, to date December 1, 1864; mustered out with company, July 19, 1865, at Raleigh, N.C.; prior service, in Second New York Volunteer Infantry. Commissioned, second lieutenant, January 20, 1865, with rank from December 1, 1864, vice Turner, promoted. SWEET, JOHN.Age, 28 years. Enlisted, November 7, 1862, at Buffalo, mustered in as corporal, Co. H, November 7, 1862, to serve three years; no further record. SWEET, ROWLAND.Age, 23 years. Enlisted, November 20, 1862, at Copake; mustered in as private, Co. E, March 31, 1863, to serve three years; no further record. SWINDLEHURST, ROBERT.Age, 25 years. Enlisted as substitute, September 5, 1864, at Albany; mustered in as private, Co. G, September 5, 1864, to serve one year; discharged, June 23, 1865, per General Order No. 83. SYKES, MICHAEL.Age, 18 years. Enlisted, November 3, 1863, at Buffalo; mustered in as private, Co. M, November 24, 1863, to serve three years; appointed corporal, August 13, 1864; discharged, to date July 19, 1865. SYLVESTER, ALBERT.Age, 20 years. Enlisted, August 24, 1864, at Truxton, mustered in as private, Co. L, August 24, 1864, to serve three years; mustered out with company, July 19, 1865, at Raleigh, N.C.
SYLVESTER, WILLIAM.Age, 32 years. Enlisted, October 10, 1864, at Buffalo; mustered in as private, Co. E, October 11, 1864, to serve three years; absent on furlough on muster out of company, July 19, 1865; no further record. SYMMS, GARDNER G.Age, 23 years. Enlisted, September 29, 1863, at Buffalo; mustered in as private, Co. M, November 24, 1863, to serve three years; appointed first sergeant, November 24, 1863; reduced to ranks, May 1, 1864; discharged, May 17, 1864, by enlistment in United States Navy. TALLMAN, CHARLES H. - Age, 21 years. Enlisted, August 19, 1863, at Buffalo; mustered in as commissary sergeant, Co. K, September 10, 1863, to serve three years; reported as duty sergeant, February 29, 1864; mustered out with company, July 19, 1865, at Raleigh, N.C.; prior service in Twenty-first New York Volunteers. TANNER, JOHN. - Age, 30 years. Enlisted, January 19, 1863, at Buffalo; mustered in as corporal, Co. F, January 19, 1863, to serve three years; transferred to Co. E, May 20, 1863, reduced, same date; died of disease, October 5, 1864, in hospital at New Berne, N.C.
TANNER, SAMUEL W. - Age, 21 years. Enlisted, January 3, 1863, at Albany; mustered in as second lieutenant, Co. D, January 3, 1863, to serve three years; transferred to Co. E, May 20, 1863; detached, commanding Co. C, October 1863; resigned, January 26, 1864. Commissioned second lieutenant, November 20, 1863, with rank from January 3, 1863, original; first lieutenant, January 8, 1864, with rank from November 20, 1863, vice Loud, promoted; not-mustered. TANSY, MICHAEL. - Age, 28 years. Enlisted, November 14, 1862, at Buffalo; mustered in as private, Co. D, November 14, 1862, to serve three years; no further record. TANSMYER, CLAMER. - Age, 31 years. Enlisted, January 2, 1863, at Buffalo; mustered in as private, Co. L, January 2, 1863, to serve three years; transferred to Co. E, May 20, 1863; in confinement at Fort Macon, N.C., by sentence of general court-martial (sentence of 18 months hard labor); in confinement on muster out of company, July 19, 1865; also borne as Tonsmeyer, K. F.; also borne as Tansmayer, C. F.; no further record. TAPLIN, WATSON. - Age, 18 years. Enlisted, August 15, 1862, at Fulton; mustered in as private, Co. A, August 22, 1862, to serve three years; deserted, prior to muster in of company, November 19, 1862. TARFIELD, THOMAS, see Tofield, Thomas. TAYLOR, EDWIN C. - Age, 19, years. Enlisted as a private, "unassigned," September 15, 1862, at Austerlitz, to serve three years; no further record. TAYLOR, GEORGE. - Age, 37 years. Enlisted, December 18, 1862, at Buffalo; mustered in as private, Co. L, December 18, 1862, to serve three years; transferred to Co. E, May 20, 1863; mustered out, June 19, 1865, at Davids Island, New York Harbor. TAYLOR, HARMON. - Age, 18 years. Enlisted as a private, "unassigned," September 9, 1862, at Austerlitz, to serve three years; no further record. TAYLOR, JOHN. - Age, 23 years. Enlisted, December 31, 1862, at Concord; mustered in as private, Co. D, January 1, 1863, to serve three years; captured beyond outpost, August 10, 1864; no further record; also borne as Josiah Taylor. TAYLOR, LEWIS. - Age, 25 years. Enlisted as substitute, August 31, 1864, at Albany; mustered in as private, Co. G, August 31, 1864, to serve one year; discharged, June 2,3 1865, per General Order No. 83, C. S., War Department, Adjutant-Generals Office. TAYLOR, LESTER. - Age, 28 years. Enlisted, August 13, 1862, at Fulton; mustered in as private, Co. A, November 19, 1862, to serve three years; captured July 20, 1863, at Tarboro, N.C.; died while a prisoner at Richmond. TAYLOR, MYRON. - Age, 20 years. Enlisted, August 15, 1862, at Oswego; mustered in as private, Co. A, November 19, 1862, to serve three years; captured, July 20, 1863, at Tarboro, N.C.; died, while a prisoner of war, at Andersonville, Ga.
TAYLOR, RODNEY M. - Age, 39 years. Reported mustered in as captain, Co. E, December 13, 1862; transferred to Co. H, June 18, 1863; promoted major, November 25, 1863; mustered in as major, January 5, 1864; mustered out with regiment, July 19, 1865, at Raleigh, N.C. Commissioned captain, November 20, 1863, with rank from December 8, 1862, original; major, January 14, 1864, with rank from November 20, 1863, original. TAYLOR, ROSWELL P. - Age, 38 years. Enlisted, August 15, 1862, at Fulton; mustered in as commissary sergeant, Co. A, November 19, 1862, to serve three years; reduced to ranks, May 20, 1863; died of disease, August 4, 1863, at Annapolis, Md. TAYLOR, SIMON. - Age, 38 years. Enlisted, August 21, 1862, at Oswego; mustered in as private, Co. A, November 19, 1862, to serve three years; no further record. TAYLOR, THOMAS. - Age, 36 years. Enlisted, December 29, 1863, at New York city; mustered in as private, "unassigned," December 29, 1863, to serve three years; no further record. TAYLOR, WILLIAM. - Age, 22 years. Enlisted, July 18, 1863, at New York; mustered in as private, Co. G, August 7, 1863, to serve three years; deserted, August 27, 1863, at Staten Island, N.Y.
TEMPLE, JAMES. - Age, not stated. Reported as deserted from Third Cavalry Regiment, September -, 1862; apprehended, and again deserted, date not stated; reported as enlisted in Twelfth Cavalry; surrendered to the Third Cavalry, under Presidents proclamation, dated March 11, 1865; no further record in this cavalry. TEMPLE, MARSHALL H. - Age, 42 years. Enlisted, September 20, 1864, at Troy; mustered in as private, "unassigned," September 20, 1864, to serve one year; no further record. TEN BROECK, IRA W. - Age, 19 years. Enlisted, September 16, 1864, at South Bristol; mustered in as private, Co. H, September 16, 1864, to serve one year; captured, March 8, 1865, at Wises Forks, N.C.; returned to duty, June 20, 1865; discharged, June 23, 1865, per General Order No. 83. TERHUNE, NELSON G. - Age, 31 years. Enlisted, August 21, 1862, at Volney; mustered in as corporal, Co. B, November 19, 1862, to serve three years; reduced, May 20, 1863; appointed corporal, June 20, 1863; mustered out with company, July 19, 1865, at Raleigh, N.C.
TETTIG, WILLIAM A., see Fetting, William A.
THAYER, EDWARD. - Age, 19 years. Enlisted, December 12, 1862, at New York city; mustered in as private, Co. A, December 12, 1862, to serve three years; no further record. THEIS, PETER, see Thies, Peter. THIES, PETER. - Age, 32 years. Enlisted, December 22, 1862, at Buffalo; mustered in as private, Co. L, December 22, 1862, to serve three years; transferred to Co. E, May 20, 1863; appointed sergeant, February 18, 1863; reduced, May 20, 1863; absent, sick in Northern Hospital, July 19, 1865, at time of muster out of company; also borne as Thise and Theis; no further record. THISE, PETER, see Thies, Peter. THOMAS, ALEXANDER. - Age, 20 years. Enlisted, September 23, 1864, at Tarrytown; mustered in as private, "unassigned," September 23, 1864, to serve one year; mustered out, May 8, 1865, at Harts Island, New York Harbor. THOMAS, CHARLES. - Age, 21 years. Enlisted, December 18, 1862, at New York; mustered in as private, "unassigned," December 18, 1862, to serve three years; no further record. THOMAS, EDWARD H. - Age, 23 years. Enlisted, December 27, 1862, at Buffalo; mustered in as private, Co. G, December 27, 1862, to serve three years; promoted quartermaster sergeant, April 14, 1863; transferred to Co. D, May 20, 1863, and reduced to ranks; appointed quartermaster sergeant, November 1, 1864; mustered out with company, July 19, 1865, at Raleigh, N.C.
THOMAS, GEORGE. - Age, 26 years. Enlisted, September 10, 1863, at Buffalo; mustered in as private, Co. K, September 10, 1863, to serve three years; discharged, May 31, 1865, at Beaufort, N.C., per General Order No. 37, Department North Carolina. THOMAS, ISAAC B. - Age, 20 years. Enlisted, November 20, 1862, at Buffalo; mustered in as private, Co. H, November 20, 1862, to serve three years; also borne as Jesse B.; no further record. THOMAS, JAMES. - Age, 25 years. Enlisted, April 15, 1863, at Buffalo; mustered in as private, Co. H, April 15, 1863, to serve three years; no further record. THOMAS, JOHN. - Age, 23 years. Enlisted, April 15, 1863, at Buffalo; mustered in as private, Co. H, April 15, 1863, to serve three years; no further record. THOMAS, JOHN. - Age, 21 years. Enlisted, December 20, 1862, at Albany; mustered in as private, Co. E, March 31, 1863, to serve three years; no further record. THOMAS, JOHN, see Thomey, John. THOMAS, N. I. - Age, 39 years. Enlisted, February 12, 1863, at New York; mustered in as corporal, Co. E, March 31, 1863, to serve three years; reported as transferred from Fifth New York Cavalry to this organization in place of E. B. Scott, transferred to Fifth Cavalry; no further record. THOMEY, JOHN. - Age, 36 years. Enlisted, January 17, 1863, at Buffalo; mustered in as private, Co. E, January 19, 1863, to serve three years; reported as transferred from Co. F, May 20, 1863; absent, sick in hospital, upon muster out of company, July 19, 1865; also borne as Thomas and Tomey; no further record. THOMPSON, GEORGE. - Age, 44 years. Enlisted, January 12, 1863, at Syracuse; mustered in as private, Co. G, August 7, 1863, to serve three years; mustered out with company, July 19, 1865, at Raleigh, N.C.
THOMPSON, JAMES. - Age, 29 years. Enlisted, January 17, 1863, at New York; mustered in as private, Co. H, January 17, 1863, to serve three years; appointed quartermaster sergeant, February 18, 1863; reduced to sergeant and transferred to Co. E, May 20, 1863; appointed quartermaster sergeant, November 11, 1863; regimental quartermaster sergeant, May 20, 1864; discharged, June 9, 1865, at McDougall General Hospital. THOMPSON, JOHN. - Age, 21 years. Enlisted, November 15, 1862, at Buffalo; mustered in as private, Co. H, November 15, 1862, to serve three years; no further record. THOMPSON, JOSEPH. - Age, 43 years. Enlisted, January 6, 1863, at Syracuse; mustered in as private, Co. B, March 31, 1863, to serve three years; transferred to Co. C, May 20, 1863; deserted, May 21, 1863, from Staten Island, N.Y.
THOMPSON, NICHODEMUS. - Age, 21 years. Enlisted, November 4, 1863, at Niagara; mustered in as private, Co. M, November 24, 1862, to serve three years; in confinement on muster out of company, July 19, 1865; no further record. THOMPSON, THOMAS. - Age, 34 years. Enlisted, January 9, 1863, at New York; mustered in as corporal, Co. F, April 28, 1863, to serve three years; reduced to ranks, May 5, 1863; missing in action, April 20, 1864, at Plymouth, N.C.; died, June 28, 1864, at Andersonville, Ga.
THOMPSON, WILLIAM. - Age, 26 years. Enlisted, December 15, 1862, at New York; mustered in as private, "unassigned," December 15, 1862, to serve three years; no further record. THOMPSON, WILLIAM. - Age, 22 years. Enlisted, August 15, 1862, at Fulton; mustered in as private, Co. A, November 19, 1862, to serve three years; appointed corporal, April 23, 1863; reduced, May 20, 1863; killed in action, July 20, 1863, at Tarboro, N.C.
THOMPSON, WILLIAM. - Age, 45 years. Enlisted, August 13, 1862, at Fulton; mustered in as private, Co. A, November 19, 1862, to serve three years; captured, July 20, 1863, at Tarboro, N.C.; died, date not known, while a prisoner of war, at Richmond, Va.
THOMPSON, WILLIAM. - Age, 33 years. Enlisted, March 30, 1863, at Syracuse; mustered in as private, Co. G, August 7, 1863, to serve three years; mustered out with company, July 19, 1865, at Raleigh, N.C.
THORNE, GEORGE. - Age, 38 Years. Enlisted, December 30, 1863, at Amsterdam; mustered in as private, Co. E, January 4, 1864, to serve three years; mustered out with company, July 19, 1865, at Raleigh, N.C.; prior service in Thirty-second New York Volunteers. THORSON, GEORGE. - Age, 41 years. Enlisted, September 21, 1863, at Buffalo; mustered in as private, Co. L, September 25, 1863, to serve three years; mustered out with company, July 19, 1865, at Raleigh, N.C.
THURNER, JACOB. - Age, 42 years. Enlisted, June 24, 1863, at Buffalo; mustered in as private, Co. H, August 27, 1863, to serve three years; died of disease, September 22, 1864, at Regimental Hospital, New Berne, N.C.
TIERNEY, MICHAEL. - Age, 21 years. Enlisted, November 12, 1863, at Buffalo; mustered in as private, Co. M, November 24, 1863, to serve three years; discharged, April 28, 1864, by enlistment in United States Navy. TIFFANY, BYRON L. - Age, 25 years. Enlisted, August 14, 1863, at Buffalo; mustered in as quartermaster sergeant, Co. K, September 10, 1863, to serve three years; mustered in as second lieutenant, Co. L, to date March 23, 1865; mustered out with company, July 19, 1865, at Raleigh, N.C.; prior service in Twenty-first New York Volunteers. Commissioned second lieutenant, March 7, 1865, with rank from February 20, 1865, vice Gordon, dismissed. TIFFANY, FRANCIS H. - Age, 21 years. Enlisted, January 10, 1863, at Buffalo; mustered in as private, Co. F, January 10, 1863, to serve three years; deserted, May 18, 1863, from Staten Island; also borne on Co. E rolls. TILLOTSON, COLUMBUS C. - Age, 20 years. Enlisted, September 16, 1864, at Mount Morris, N.Y.; mustered in as private, Co. I, September 16, 1864, to serve one year; wounded March 12, 1865; mustered out, July 3, 1865, at Davids Island, New York Harbor. TIPPET, CHARLES. - Age, 28 years. Enlisted, August 29, 1863, at Buffalo; mustered in as corporal, Co. K, September 10, 1863, to serve three years; appointed sergeant, April 24, 1864; discharged, June 8, 1865, at New Berne, N.C., per General Order No. 37, Department of North Carolina. TIPPETT, JOHN W. - Age, 25 years. Enlisted, February 15, 1864, at New York; mustered in as private, Co. A, February 15, 1864, to serve three years; missing in action, April 20, 1864, at Plymouth, N.C.; prisoner of war until April 29, 1865; mustered out, July 24,1 865, under telegram War Department, Adjutant-Generals Office, May 12, 1865, at New York city; also borne as Sippett, and Lippett. TITUS, STEADMAN. - Age, 26 years. Enlisted, August 22, 1862, at Oswego; mustered in as second lieutenant, Co. B, March 31, 1863, to serve three years; transferred to Co. E, date not stated; discharged, November 5, 1863; also borne as Titus, Stedman. Commissioned second lieutenant, November 20, 1863, with rank from April 2, 1863, original. TODD, NELSON. - Age, 28 years. Enlisted, November 26, 1862, at Buffalo; mustered in as private, Co. D, November 26, 1862, to serve three years; appointed corporal, April 16, 1863; transferred to Co. A, May 20, 1863; reduced to ranks, date not stated; mustered out with company, July 19, 1865, at Raleigh, N.C.
TOFIELD, THOMAS. - Age, 27 years. Enlisted, August 13, 1862, at Oswego; mustered in as private, Co. A, November 19, 1862, to serve three years; deserted, on sick furlough, March 13, 1863, from Staten Island, N.Y.; also borne as Tarfield. TOMEY, JOHN, see Thomey, John. TOMPKINS, GRIFFIN. - Age, 24 years. Enlisted, December 16, 1862, at New York; mustered in as private, Co. A, December 16, 1862, to serve three years; appointed quartermaster sergeant, date not stated; appointed regimental quartermaster sergeant, date not stated; reduced to ranks, September 26, 1863; appointed regimental commissary sergeant, date not stated; reduced to the ranks, December 25, 1863; mustered out with Co. A, July 19, 1865, at Raleigh, N.C.
TOMPKINS, STEPHEN. - Age, 36 years. Enlisted, January 1, 1863, at Buffalo; mustered in as private, Co. L, January 2, 1863, to serve three years; no further record. TONSMEYER, K. T., see Tansmyer, Clamer. TOOHEY, JEREMIAH. - Age, 44 years. Enlisted, July 8, 1863, at Troy; mustered in as private, Co. I, September 2, 1863, to serve three years; mustered out with company, July 19, 1865, at Raleigh, N.C.
TOTTEN, GEORGE. - Age, 24 years. Enlisted, September 6, 1864, at Albany; mustered in as private, Co. M, September 6, 1864, to serve one year; in confinement, July 19, 1865, on muster out of company; no further record. TOWN, CHARLES. - Age, 18 years. Enlisted, November 20, 1862, at Buffalo; mustered in as private, Co. E, November 20, 1862, to serve three years; transferred to Co. D, May 20, 1863; mustered out with company, July 19, 1865, at Raleigh, N.C.
TOWNSEND, THOMAS. - Age, 22 years. Enlisted, January 7, 1863, at New York; mustered in as private, Co. B, March 31, 1863, to serve three years; no further record. TRACY, JOHN. - Age, 26 years. Enlisted, January 30, 1863, at Oswego; mustered in as sergeant, Co. I, March 31, 1863, to serve three years; transferred to Co. B, May 20, 1863; reduced, June 20, 1863; in arrest, February 1865; mustered out, May 24, 1865, at McDougall General Hospital, New York Harbor. TRAVER, ALBERT. - Age, 23 years. Enlisted, February 25, 1864, at Troy; mustered in as private, Co. G, February 25, 1864, to serve three years; mustered out with company, July 19, 1865, at Raleigh, N.C.
TREBER, ALBERT. - Age, 21 years. Enlisted, February 18, 1863, at New York; mustered in as private, Co. F, April 28, 1863, to serve three years; missing in action, April 20, 1864, at Plymouth, N.C.; died, August 30, 1864, at Andersonville, Ga.
TREDO, JOHN. - Age, 23 years. Enlisted as substitute, August 31, 1864, at Troy; mustered in as private, Co. G, August 31, 1864, to serve one year; prisoner of war, from March 25, 1865, to May 5, 1865; discharged, July 11, 1865, at New York. TRIAN, EUGENE, see Tryon, Eugene. TRIMBY, GEORGE, see Twimbly, George. TRUER, ARIA W. - Age, 32 years. Enlisted, November 24, 1862, at Buffalo; mustered in as corporal, Co. E, November 24, 1862, to serve three years; transferred to Co. D, May 20, 1863; appointed sergeant, May 21, 1863; reduced to ranks, June 30, 1863; transferred to the navy, March 17, 1864. TRYON, EUGENE. - Age, 17 years. Enlisted, February 20, 1863, at Buffalo; mustered in as private, Co. F, February 20, 1863, to serve three years; transferred to Co. E, May 20, 1863; discharged for disability, June 14, 1865; also borne as Trian. TUBESING, CHARLES. - Age, 18 years. Enlisted, August 17, 1863, at Buffalo; mustered in as bugler, Co. K, September 10, 1863, to serve three years; appointed sergeant, June 8, 1865; mustered out with company, July 19, 1865, at Raleigh, N.C.; prior service in Twelfth New York Volunteers. TULLY, PATRICK. - Age, 23 years. Enlisted, November 20, 1862, at Buffalo; mustered in as private, Co. G, November 20, 1862, to serve three years; transferred to Co. D, May 20, 1863; in arrest at Fort Macon, August 1863; in confinement at Fort Norfolk, Va., February 1864; died of disease, May 6, 1865, at General Hospital, Norfolk, VA.
TURNER, CHARLES. - Age, 22 years. Enlisted, December 27, 1862, at Buffalo; mustered in as private, Co. D, December 27, 1862, to serve three years; no further record. TURNER, C. R. - Age, 26 years. Age, September 3, 1864, at Fishkill; mustered in as private, "Unassigned," September 3, 1864, to serve one year; mustered out, May 88, 1865, on Harts Island, New York Harbor. TURNER, HENRY. - Age, 23 years. Enlisted, February 29, 1864, at New York city; mustered in as private, Co. I, 2 29, 1864, to serve three years; mustered out, September 2, 1865, at New York city; also borne as Harry. TURNER, WILLIAM S. - Age, 29 years. Enlisted, August 14, 1862, at Oswego; mustered in as private, Co. H, November 19, 1862, to serve three years; appointed sergeant major, May 21, 1863; mustered in as second lieutenant, Co. B, November 5, 1863; first lieutenant, Co. D, June 9, 1864; captain, to date January 24, 1865; mustered out with company, July 19, 1865, at Raleigh, N.C. Commissioned second lieutenant, January 8, 1864, with rank from November 5, 1863, vice Van Valkenburgh, promoted; first lieutenant, May 18, 1864, with rank from April 25, 1864, vice Tanner, not mustered; captain, April 22, 1865, with rank from January 19, 1865, vice Van Valkenburgh, discharged. TWIMBLY, GEORGE. - Age, 22 years. Enlisted, October 1, 1864, at Elmira; mustered in as private, Co. D, October 1, 1864, to serve three years; died, December 10, 1864, at Regimental Hospital, New Berne, N.C.; also borne as Trimby. TYLER, GEORGE D. - Age, 32 years. Enlisted, September 29, 1862, at Austerlitz; mustered in as private, Co. C, September 29, 1862, to serve three years; appointed quartermaster sergeant, same date; reduced to ranks, May 18, 1863; appointed saddler, and transferred to Co. A, January 1, 1865; mustered out with company, July 19, 1865, at Raleigh, N.C.